This audio-video installation combines sights and sounds of the “Wild North” with the newest technologies. It consists of five old tin cans and a big screen. 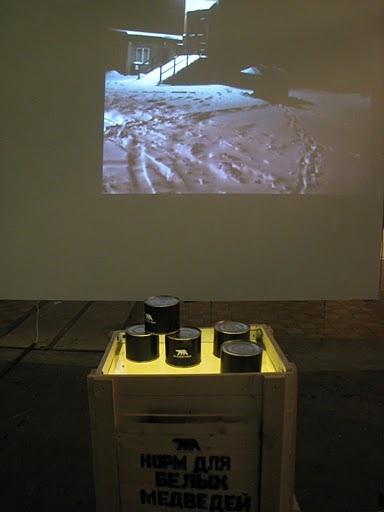 The viewer handles the cans, and each of them triggers a video on the screen, made in the Arctic and set on the songs of the indigenous people – droning, yet very rhythmical. Judging by the video context, the artist wants to remain a neutral observer. Thus, the viewer gets a portion of control and some food (or fodder) for reflection – on the future of the Arctic and the relationship between an artist and a viewer in contemporary art. *In 2009 Anna Frants was part of a 20 person expeditionary residency program that sailed into the mysterious Arctic Circle. The mission of this 14 day venture was to bring together artist of all disciplines, scientists, architects, and educators who would collectively explore a remote and fascinating destination abroad a specially outfitted sailing vessel. This trip into the Arctic became an incubator for thought, artistic experimentation and invention, relating directly to their unique environment. Polar Bear Fodder is what artist Anna Frants cultivated from her experience.